Hi, my name is Michelle Nicholson and I'm very proud to say I am part of a dynamic team which I have the privilege of leading. My aim in my role as Senior Manager is to create enriched learning environments which are welcoming and provide families with confidence in what we do. 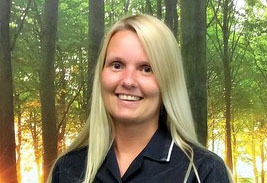 Leading the way is to ensure the right people are in the right jobs and here at the Country Park Nursery, we have developed a caring, motivated and committed staff team. My commitment is to the continuous development of both staff and the nursery and to ensure that children move on to their next chapter being successful and confident individuals, who have had a lot of care and fun along the way. I would welcome you to come and visit so I can introduce you to my great team and environments. I look forward to meeting you in the near future.